The ABCD Diaries: Fall Fashion Must-Have: Quintessential Lee Jeans! I live in blue jeans pretty much year round, but in the Fall it's always fun to add a few new pair to the lineup. Luckily for me, Lee is always coming out with new styles that are modern and trendy for the over 30 crowd that don't fit like your typical "mom jeans." Two great styles for this Fall are from the Curvy Fit line: the Lena Skinny Jean and the Alanna Bootcut, both of which are in the Modern Series from Lee. 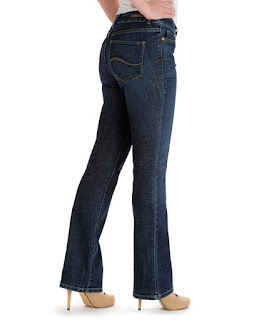 "The Lena's high stretch rayon denim keeps its shape all day (no bagging out!) and is soft to the touch. 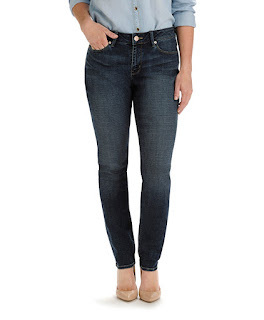 This dark wash skinny jean just might be your new go-to for great-looking, great-feeling style." These are so cute and look great with boots, heels or flats. They are flattering and comfy. I'm not really a huge fan of "skinny" jeans, but these have softened me a little. They aren't uncomfortably tight and look great! "Cut and sewn in a premium stretch denim, the Alanna Curvy Bootcut will hug your curves and keep their shape wear after wear. Featuring our No-Gap waistband and the perfect modern updates, you'll have a hard time wearing anything else!" These are my go-to jeans. No matter what the occasion, these jeans rock! I love bootcut jeans and these are super comfy and I always get compliments when I wear them. They are forgiving and flattering at the same time:) Definitely a wardrobe staple, not just in the Fall, but year round! Both of these pair of jeans are from the Curvy Fit collection and designed with your curves in mind. They feature a no-gap waistband that is mid-rise in the front and higher in the back for curve-hugging comfort. Not your typical "mom jeans!"